Ashraf Sarhan is a passionate software engineer, an open source enthusiast, has a Bsc. degree in Computer and Information Systems from Alexandria University. He is experienced in building large, scalable and distributed enterprise applications/service in multiple domains. He also has a keen interest in JavaEE, SOA, Agile and Big Data technologies. 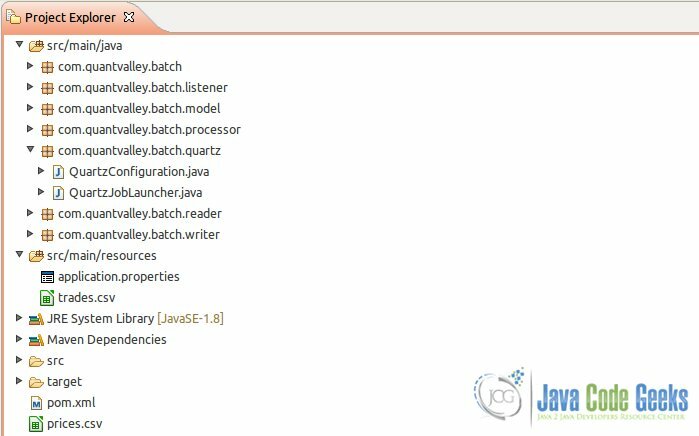 Through this article, we are going to show you how to run Spring Batch using Quartz. Spring Batch and Quartz have different goals. Spring Batch provides functionality for processing large volumes of data and Quartz provides functionality for scheduling tasks. So Quartz could complement Spring Batch, a common combination would be to use Quartz as a trigger for a Spring Batch job using a Cron expression and the Spring Core convenience SchedulerFactoryBean. Quartz has three main components: a scheduler, a job, and a trigger. A scheduler, which is obtained from a SchedulerFactory, serves as a registry of JobDetails (a reference to a Quartz job) and triggers and it is responsible for executing a job when its associated trigger fires. A job is a unit of work that can be executed. A trigger defines when a job is to be run. When a trigger fires, telling Quartz to execute a job, a JobDetails object is created to define the individual execution of the job. Add the required dependencies to your pom.xml file. Write your own Quartz job to launch your job using Spring’s QuartzJobBean. Configure a JobDetailBean provided by Spring to create a Quartz JobDetail. Configure a trigger to define when your job should run. To show how Quartz can be used to periodically execute a Spring Batch job, let’s use our job of the previous example Spring Batch ETL Job which calculates the financial stock market OHLC data, By adding Quartz scheduling feature to this job, it will automatically be executed every day when the daily trading session is finished. We added additional required dependencies to our POM file. In this example, there are three new dependencies. The first is the Quartz framework itself. The second dependency we add, is for the spring-context-support artifact. This package from Spring, provides the classes required to integrate Quartz easily with Spring. We use the same Spring Batch ETL Job configuration while we add more Quartz specific configuration through the QuartzConfiguration.java class where we defined our Quartz configuration, then we will import this Quartz configuration into BatchConfiguration.java using @import annotation. A BeanPostProcessor that registers Job beans with a JobRegistry. Include a bean of this type along with your job configuration, and use the same JobRegistry as a JobLocator when you need to locate a Job to launch. Spring provides JobDetailFactoryBean that uses Quartz JobDetail. We use it to configure complex job such as job scheduling using CRON expression. Create job implementing QuartzJobBean interface and configure to JobDetailFactoryBean. We also configure job name and group name. To pass the parameter to job, it provides setJobDataAsMap(Map<String,?> jobDataAsMap) method. Spring provides CronTriggerFactoryBean that uses Quartz CronTrigger. CronTriggerFactoryBean configures JobDetailFactoryBean. We also configure start delay, trigger name, group name and CRON expression to schedule the job. Spring provides SchedulerFactoryBean that uses Quartz Scheduler. Using SchedulerFactoryBean we register all the triggers. In our case we have CronTriggerFactoryBeantrigger that is being registered. After the job first run, Spring Batch will throws a JobInstanceAlreadyCompleteException which says job instance already exists, To avoid that, set step allowStartIfComplete(boolean allowStartIfComplete) to true. QuartzJobLauncher.java is a single class that extends Spring’s QuartzJobBean. This implementation of Quartz’s Job interface is a helpful class that allows you to implement only the pieces of logic that pertain to your work, leaving the manipulation of the scheduler and so on to Spring. In this case, we override the executeInternal(org.quartz.JobExecutionContext context) method from which to execute the job. In this case, we want to reference one parameter: the name of the job. With the name of the job obtained, you use the JobLocator to retrieve the Spring Batch job from the JobRegistry. Once that is complete, we can execute the job using the JobLauncher. Application.java is our main class to our Quartz Batch Job. 2016-07-23 14:53:07.012  WARN 4347 --- [           main] o.s.c.a.ConfigurationClassEnhancer       : @Bean method ScopeConfiguration.stepScope is non-static and returns an object assignable to Spring's BeanFactoryPostProcessor interface. This will result in a failure to process annotations such as @Autowired, @Resource and @PostConstruct within the method's declaring @Configuration class. Add the 'static' modifier to this method to avoid these container lifecycle issues; see @Bean javadoc for complete details. 2016-07-23 14:53:07.023  WARN 4347 --- [           main] o.s.c.a.ConfigurationClassEnhancer       : @Bean method ScopeConfiguration.jobScope is non-static and returns an object assignable to Spring's BeanFactoryPostProcessor interface. This will result in a failure to process annotations such as @Autowired, @Resource and @PostConstruct within the method's declaring @Configuration class. Add the 'static' modifier to this method to avoid these container lifecycle issues; see @Bean javadoc for complete details. 2016-07-23 14:53:08.223  INFO 4347 --- [           main] org.quartz.core.QuartzScheduler          : Quartz Scheduler v.2.2.3 created. 2016-07-23 14:53:08.224  INFO 4347 --- [           main] org.quartz.simpl.RAMJobStore             : RAMJobStore initialized. 2016-07-23 14:53:08.225  INFO 4347 --- [           main] org.quartz.impl.StdSchedulerFactory      : Quartz scheduler 'schedulerFactoryBean' initialized from an externally provided properties instance. 2016-07-23 14:53:09.120  INFO 4347 --- [           main] o.s.b.c.l.support.SimpleJobLauncher      : No TaskExecutor has been set, defaulting to synchronous executor. 2016-07-23 14:53:09.286  INFO 4347 --- [           main] o.s.jdbc.datasource.init.ScriptUtils     : Executed SQL script from class path resource [org/springframework/batch/core/schema-hsqldb.sql] in 8 ms.
2016-07-23 14:53:09.346  INFO 4347 --- [           main] org.quartz.core.QuartzScheduler          : Scheduler schedulerFactoryBean_$_NON_CLUSTERED started. This was an example to show how to integrate Quartz with Spring Batch. I have tried this out. The only problem I see is that, after I gave a cron expression 0 09 22 ? * *, the job starts at 22:09, but the launcher executes every 5 minutes after that. I wanted this to run every day at 22:09. What am I doing wrong?